Read the instructions posted on this page to learn how to access the official FreshCo job application (online version). 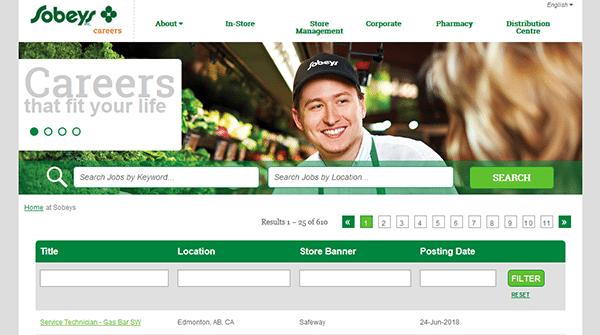 The links posted above/below will lead you to FreshCo’s main careers website (where you will be able to fill out/submit the application form). Numerous current openings can be applied for by creating an online account and going through the application process. The instructions posted below detail how to create an account, search for current openings, and fill out/submit an application. About FreshCo: FreshCo is a supermarket chain based out of Canada that is owned/operated by Sobeys. All of the chain’s locations are in Ontario. The company was founded in 2010 and is headquartered in Mississauga. 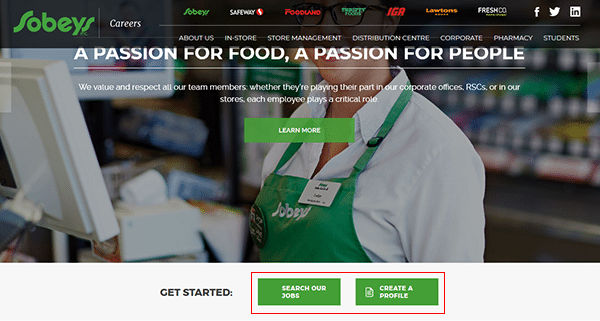 Step 1 – Start by going to FreshCo’s parent company’s careers page (Sobeys Careers). Click here to load the page in another tab/window within your current browser. Step 2 – Scroll down the page and click the “Search Our Jobs” button. Step 3 – Use one of the two search forms to look for a specific job type that the company is currently looking to fill. Step 4 – The results will display directly below the search form(s). Click the title/link of the role that you’re interested in applying for to move to the next step of the process. Step 5 – Review the entire description section in order to learn more about the role’s requirements, responsibilities, etc. When you’re ready to move to the actual application form click the “Apply” button in the top corner of the page. 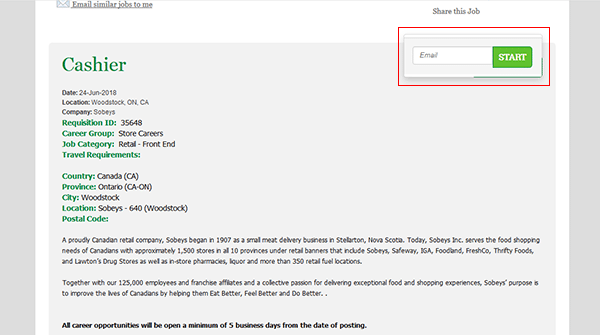 Enter your email address into the field, and then hit the “Start” button.